“…game design reflects the national soul. Americans are predisposed to enjoy games where the rules encourage lots of scoring. Soccer wasn’t architected that way, so Americans don’t like it. Baseball, basketball, and football, in contrast, were designed to allow for lots of scoring — and they are thus huge hits in America, a country obsessed with toting up manichean victories. Went to the Royal College of Art show last night, and amongst some beers, the sweltering heat of a packed art college and saying lots of hellos to people I haven't seen in a long time I actually got to see some work. The best thing though for the vain interaction designer about town is finding that you have been fabbed into a tiny USB-connected version of yourself that jumps up and collapses to my iChat status. Jack Schulze of Schulze&Webb made the Availbots (there's also one of Ben Cerveny, apparently) for his end of year show – it's a triumph of servos and string. Jack sent me a rendering from the CAD/CAM file a few weeks back announcing his intention to do it, and I've been using it as my icon here on Vox ever since. zombie fuller, originally uploaded by 1541. 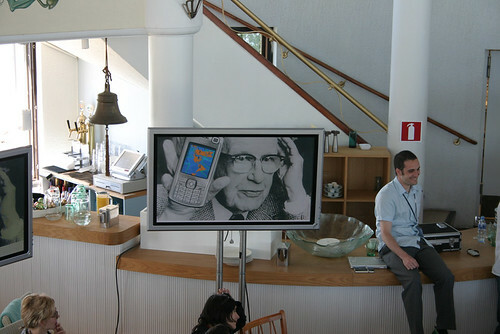 If I use my “Buckminster Fuller with a Mobile” slide once more. This will be used in anger. Oh yes. I've started reading a series of books by Phillip Reeve that I've inherited from Foe. With her new job producing science exhibits for kids and teenagers, we have a lot of 'books for young adults' in the house under the guise of research. I finished the first in the series "Mortal Engines" yesterday. They are pretty standard adventure stories I guess (the kids are orphans of righteous parents – heard that before anywhere?) but the imagination and detail invested in the setting is very enjoyable. 1989. The Number. Another Summer. Just watched "The Summer of 1989" in a shameless bout of nostalgia. It was a whistle-stop tour through the most exciting year of my youth. The last year of school, just before leaving for college. Stuck in a small seaside town, but sensing still that you were taking part in something much bigger that was going on. Acid-House, illegal raves, the fabled M25 Orbital party scene were all quite far away. A couple of the cool kids you knew in Art class had been at a rave, perhaps, you'd heard. Probably the cultural moment they showed that had most impact for me was the Top-of-the-pops (if you don't know, TOTP is a venerable and somewhat crusty weekly pop programme on British TV) where both The Stone Roses and The Happy Mondays played. Back in those days of four-channel, unfragmented, untimeshifted media, something like that hit like a meteor – an extinction-level event for the cultural dinosaurs around you. You knew that you and your bright-eyed, wide-eyed nimble pop mammals were now going to inherit the earth. I did actually get to one illegal party in 1989. It was canonical stuff. Waiting in the carpark of the Swansea Odeon Cinema, for the one person who knew where it was happening to lead us in the canonical convoy up into the hills around the town. It was in the canonical farmers field, with the bemused but happy farmer and his wife making a killing on bottled water and rather-delicious (as I remember) home-made burgers. Muddy and manic, the throng of dancing, smiley, happy people stretched for, oh, hundreds of metres – this was South Wales, not Castlemorton – assisted by speed and acid mainly it seemed – again, this was South Wales, and the new wonder chemical had not made it at least to Swansea in great quantities by then. One other memory prompted by the programme, and a question. The show attempted to tie (rather lightly) the cultural/political mood in the UK to the wider changes around the world: fall of the Berlin Wall, Tiananmen Square, etc. There was no mention of what was happening in the USA at the time at all. The credits rolled to the sound of Public Enemy's "Fight the Power", which along with The Stone Roses and 808 State could often be heard blasting (!) from the stereo of my doughty little Fiat Panda as it dashed around the South Wales coast full of my friends. I don't really know what was happening if you were 17/18 in 1989 in the USA – perhaps people in my neighbourhood here could fill me in? Was there a sense of revolution (false or otherwise) in the air like there was in the UK? What was the counterculture like? What was going on for you? There was a lunchtime lecture at UCL a few years ago about the mathematics of coincidence*, and how when viewed rationally, most coincidences are quite likely – but for some reason we seem to be wired to project great significance and unlikelihood into them. Which is the old saw I trot out in reponse to the old saw that it's such a small world.